Currently most states do allow “Open Carry” in some form. Arizona does allow Open Carry without a permit. Some states require a permit to Open Carry, while others do not. Some States allow the open carry of Long Guns whereas many do not. And best of all, some States are what the call “Constitutional Carry”, which means that you do not need a permit for concealed carry or for open carry. Basically, the Second Amendment is your permit. My State, the Peoples Republik of Kalifornistan, no longer allows open carry and barely allows “Concealed Carry”. You need a pretty damn good reason, what they call “Good Cause”, or you don’t get a permit to carry concealed in this State. That question is before the Ninth District Court of Appeals right now for the Second time. We won the decision the first time but the liberals would’t stand for it and resorted to a Parlamentary trick wherein the State requested an “en banc” hearing, even though the State was not a party to the suit. They are supposed be one of the players in the original lawsuit for that to be granted, but the judges have allowed it anyway. We’re waiting for the decision now. But I digress. Below is a list of the States and their position on Open Carry. Note: We are not lawyers. Specific information for the laws surrounding the carrying of guns in your State should be verified by contacting your State and obtaining particular information on the laws currently active in your State. State laws are currently changing. Some States allow local laws to preempt State laws. Make sure to keep informed on what is happening in your State and/or County. (1) Open carry is permitted while traveling to and from lawful shooting events, hunting, fishing, and camping, only. Otherwise it is not permitted. (2) Open carry is permitted in some unincorporated areas of the state only, but not all. Be careful. Not permitted in cities and Metropolitan areas. (3) Be aware of local ordinances. (4) Many large cities have passed ordinance against loaded firearms in public places. Also, all public buildings are off limits unless you have a concealed carry permit. (5) Must have a permit to open carry in a vehicle, and in Philadelphia. In 42 of the nation’s states, Americans are legally permitted to openly carry firearms in public. Though state and municipal ordinances place limits on open carry in many places, open carry rights—especially with regard to long guns—have generally been well-recognized throughout the nation. It is important to know your states laws if you plan to carry openly. 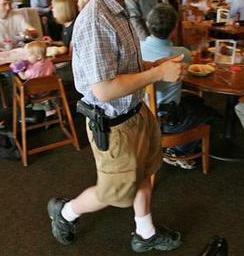 There is a healthy open carry movement in the United States. Many State legislatures are contemplating relaxing their Open Carry laws. Some States are also looking to allowing carrying on college campuses, including Open Carry. But with the inconsistency of the laws across the nation, if you are going to be traveling, you should study the laws of the States through which you will be traveling. For that matter you be very aware of the laws in the State in which you live before you venture outside your door with your weapon on you hip. Be armed and be careful. Disclaimer: We have made every effort to provide correct information. However, the legal landscape surrounding open carry is fluid and subject to a myriad of political influences in the various states. Therefore, any and all information you glean from this site should be independently verified! I wrote a blog about this a little while ago because I was concerned that a lot of people were being killed who were in possession of guns illegally. It was frustrating to me when I started doing research on the gun laws in America. Everything is so different when it comes to guns and what’s actually permissible and prohibited. I understand that a lot of people are under the impression that from state-to-state the rules or laws are the same. I wish we were more united when it came to this.